Paul Heckingbottom speaks with assistant boss Robbie Stockdale during the 2-0 win. 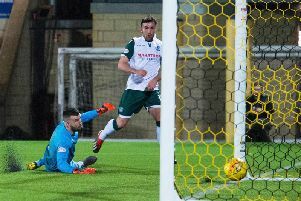 Analysis from the Tony Macaroni Arena as Hibs make it six league games undefeated, including five wins, under Paul Heckingbottom. When all else fails Hibs can rely on their deceptively good target man to provide a threat from nothing. There aren't many 5ft 10in players in football, especially in Scotland, who could do such an effective job leading the line on their own. Marc McNulty may not have enjoyed his most productive game in a Hibs jersey since joining on loan from Reading, but he provided the only avenue from which the visitors could threaten in the opening 70 minutes of this contest. In the first half, especially, he was excellent at holding up play, dropping deep and linking with his team-mates. 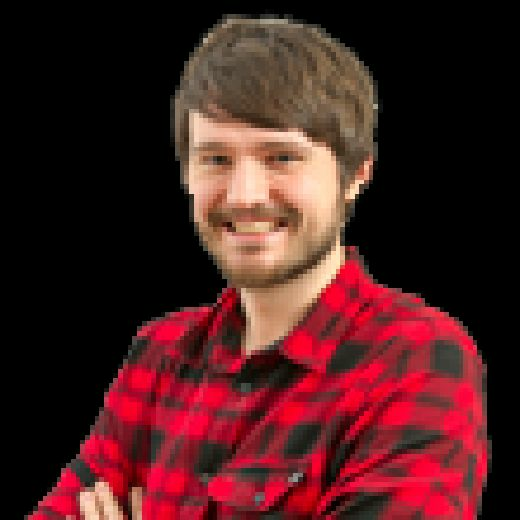 Livingston continually sagged off Darren McGregor and encouraged the Hibs defender to knock it long. With McNulty to aim for, it was rarely a wasted pass. Stephane Omeonga has thoroughly impressed in recent weeks but this wasn't the night for him. His industry was still on show, but the on loan Genoa midfielder lacked the touch to make a telling contribution in the final third. With time ticking away and the game still goalless, Paul Heckingbottom decided to introduce Vykintas Slivka for the Belgian. Immediately the away side got a lift from the substitution. He was able to find pockets of space in more advanced areas of the park and was involved in the move which led to the corner from which Paul Hanlon scored. With injury problems robbing them of experienced cover, this was one of few hands Heckingbottom could have played in an attacking sense. Just as well he played it expertly. This may not be the most popular opinion with a section of the Hibs support who've still to fully embrace Mallan in the manner they did his predecessors John McGinn, Dylan McGeouch and Scott Allan. 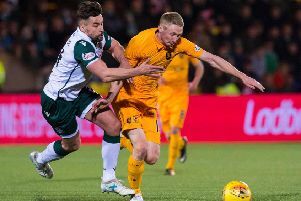 But in a campaign where every regular first-team star has saw their involvement truncated by injury or suffered a sustained period of poor form, Mallan's bottom line could see him awarded with the club's individual player award. He took his tally to 13 goals for the season with the victory-clinching strike in this one, while his corner for the opener underlined the creative powers in that right foot of his. He admitted himself his form suffered in the middle part of the campaign, but he's coming to prominence again under Heckingbottom.